Antonetta "Etta" Brennan , 89, died Saturday, February 9, at home surrounded by her loving family. She was the beloved wife of Joseph E. Brennan, Sr.
Born in Providence she was a daughter of the late Raffaele and Antonetta (Grasso) Bianco. Antonetta was the former co owner of Brennan Oil Company of North Providence, until its sale in 1998. A world traveler, she loved traveling to Bermuda, shopping, going to casinos, dancing, and lived life to the fullest. Always caring for those less fortunate, Antonetta was a lifelong donor of Saint Jude Children’s Hospital as well as numerous other charities. Most of all, she cared for her family as her role as the matriarch. Besides her husband, she leaves two sons, Dennis R. Brennan and Joseph E. Brennan, Jr., a daughter, Cheryl-Ann Grossi, 5 grandchildren, 5 great grandchildren, and many nieces and nephews. She was the sister of the late Frank, Angelo, Raffaele, Costanzo, and Antonio Bianco, Laurenza Santomassimo, and Maria Vendettoli. 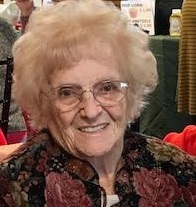 Her funeral will be held on Thursday, February 14, 2019 at 8:30 am from the Russell J. Boyle & Son Funeral Home, 331 Smith Street, Providence. Mass of Christian Burial at 10:00 am in Mary, Mother of Mankind Church, 25 4th St, North Providence, RI 02911. Burial will follow in Saint Ann Cemetery, Cranston. Visiting hours Wednesday, February 13, 2019 from 4 to 7 pm. In lieu of flowers, donations to Saint Jude Children’s Hospital 262 Danny Thomas Pl, Memphis, TN 38105 in her memory would be appreciated.